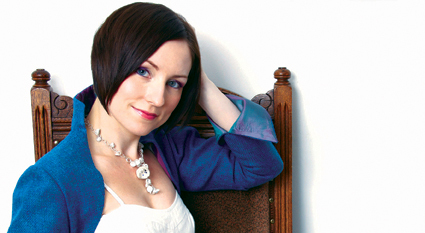 Julie Fowlis has the voice of a Celtic angel. With her ancient Scots Gaelic songs of earth and sky, she calls up a salty North wind that whistles through the mossy crags of remote, forgotten islands. On her latest release Uam (Cadiz Music/Shoeshine Records) she harnesses a stable of veteran musicians, including her Dublin-born husband Éamon Doorley (of Danu fame) and Scottish fiddler Duncan Chisholm. This flawless album is a gorgeous nod to the now-thriving but almost-lost Scots Gaelic tradition. And a smattering of lively Irish tunes keeps it fun. Here, she has brought a grandaughter of Scotland and Ireland back to its roots with a bilingual version of “Wind and Rain,” a mystically gory folk song from the Scots-Irish tradition that American folkies will find familiar … the next track, “Thig am bàta,” is the same song, but preserved in the Hebrides by generations of waulking women, sitting around a table hand- (and sometimes foot-) massaging tweed as part of the shrinking process.